A love of learning that will last a lifetime! At Holly Springs School for Early Education, You’re Family! Your child will learn and grow with Holly Springs School for Early Education! For parents, there are few greater concerns for children than their education. Choosing the best childcare service and education resources for your child and your family can be a daunting task. This is especially true with the vast number of education centers that seem to be sprouting up by the dozens. Each of these centers professes to provide ‘one-of-a-kind’ care and ‘effective curriculum’, making the decision all the more difficult. At Holly Springs School for Early Education, we help make the decision simpler. With more than a decade of service and noted successes, we offer exceptional care, skillful instruction by highly qualified and well-seasoned staff—all with the individual growth and achievement of the child as the foundation. Our current programs provide childcare and early learning for infants, six-weeks and older, continuing through age five. Additionally, we offer school-age care and track out services for families who need additional options for children as they advance beyond the Center’s population at our ancillary facility- for grades K-5. In the summer months, we also offer an exciting and adventurous curriculum to combat summer educational loss, while providing the space for ‘children to just be children’. Voted Best Pre-School in Holly Springs 2012, our center has worked diligently to create an environment where teachers, children, and families are partners in education. The intimate atmosphere provides an incredibly rich and rewarding pre-school experience. We are recognized as a model for other centers and a frequent training site for student teachers and school-based professionals. Holly Springs School has fun and amazing programs for your child! As a strong community partner, we work determinedly to foster a healthy kinship where our programs are child-centered, teacher and child-initiated, as well as parent and community supported. One of our greatest desires is to develop and maintain programs that our parents, children, teachers and community treasure and trust. 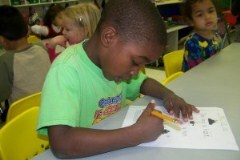 Everyone at Holly Springs School for Early Education works diligently towards that goal. We are proud to offer discounts for Holly Springs Employees, Teachers and active military. We have the freedom to tailor our curriculum to fit each child’s needs, giving us the flexibility to offer more advanced and better-suited programming than other pre-school education and childcare facilities. Education is essential, but equally important to us is constructing an enjoyable and innovative space where your child feels the joys of just being a child. In addition to the educational curriculum, each of our classes participates in enrichment courses at no additional cost. As we shape the individualized programs, we enlist the input of our parents. They, too, are an integral part of each child’s success. the right touch of learning, family and friends!“ -Megan L.
At Holly Springs School for Early Education, we are family! As family, we want to provide your child with a safe and caring second home where they can live, laugh, and learn—having more fun and learning decidedly more than you imagined. We never want to lose sight of why we are in business…for you and your children.